Every customer wants a swift and smooth payment transaction, with little fuss. This holds true regardless of whether they’re buying from a major enterprise or a small business. That goal is certainly possible with PayPal Here’s two new payment card readers. PayPal recently launched a Chip and Swipe reader and a Chip and Tap reader, both of which will help users and small companies easily conduct credit card transactions anywhere. The Chip and Swipe reader is an improved version of the company’s previous swipe-style reader. It now comes with support for debit and credit cards with EMV chip technology. Meanwhile, the Chip and Tap reader can process contactless payment options from NFC-supported devices and also accepts EMV-supported cards. The device also comes with a portable charging stand. Both payment readers can easily process transaction choices like Apple Pay, Samsung Pay, and Google Pay. PayPal’s new readers have been designed with portability in mind. The two devices are about the size of a deck of cards, making it possible for small retailers and entrepreneurs to do business in any location—a country fair, the neighborhood cafe—without worrying about wires or having to carry bulky hardware. They can easily connect to any mobile device using Bluetooth technology. The readers also have a user-friendly interface and can now be used for extended periods, thanks to their rechargeable lithium-ion battery. 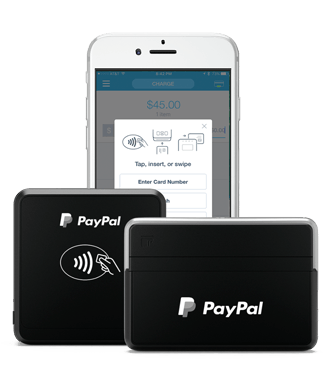 PayPal is offering the Chip and Swipe reader for $24.99 and the Chip and Tap reader for $59.99. Both devices will work seamlessly with the PayPal Here. The app is available via the Apple App Store and Google Play. In a statement, PayPal In-Store’s Chief Chris Gardner stated that the company understands the “challenges small businesses face—including protection from fraudulent transactions and the costs of equipment to run their business—and constantly work to develop products and services that allow them to thrive in an increasingly competitive environment.” Their new and affordable card payment readers are their newest endeavor to help small business. Gardner also pointed out that small and medium businesses also look for a “one-stop shop” for all their commerce and payment services. After all, these companies don’t have the time to deal with various vendors to manage all these financial activities. PayPal is determined to be the company to handle these demands. Merchants can use PayPal for their online transactions, PayPal Here for their physical processes, and PayPal Working Capital to help finance their expansion.